CBD can be consumed in various ways and each has its own benefits. All CBD products are in the form of capsules, powder, oral sprays, and even edibles like cookies. CBD is a compound of cannabis which does not give you a high. It does not contain THC, and has many good medical properties including relief from anxiety, reducing inflammation, pain and provides sound sleep. One of the ways to consume CBD is in the form of softgel capsules. How to select good Gel Caps or Gel Capsules? We have chosen all top brands based on customer feedback as well as new and promising brands. Select brands which give customer service and have a good website where products are easy to buy. Another important aspect while choosing capsules is transparency. Especially when it comes to CBD, products should be clearly labeled for strength and any additional ingredients. Brands should also make their source of hemp clear alongside the method of extraction and how they manufacture their products. Brands which make third-party lab results available are also trusted. Their test results should be available online or at least on request. Companies which provide more information are to be preferred over ones with less to no information. Why take CBD Gel Capsules? CBD gel capsules or softgels are a convenient way to take CBD supplements. When ti comes to gel caps, you don’t have to taste the hemp and can avoid sugar in the form of gummies. Capsules are discrete and you can start from a fixed low dosage. Always see how your body reacts to the lowest dose and then proceed further. Made from organic, Colorado-grown hemp, Bluebird Botanicals CBD Oil Softgels are a huge favorite among many customers. You get 15mg of CBD per capsule and each bottle from Bluebird contains 30 capsules. They have amazing customer service and shipping is available for a low price of $3.90. They prove themselves to be a reliable site with independent Test Results available online. They are highly beneficial, with naturally occurring terpenes like Beta-caryophyllene, Humulene, Myrcene, and more. 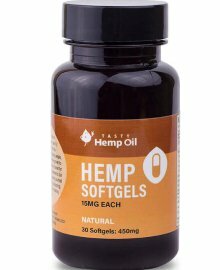 These softgels carry plenty of nutrition and are loaded with the goodness of full-spectrum hemp oil extract. Besides, they also have vitamins, minerals, and essential fatty acids omega-3 and omega-6. The calming effects of CBD are easier to obtain in this capsule. You have worldwide delivery and the product is third-party tested. With a 90-day money-back guarantee, we love these gels which are highly beneficial. 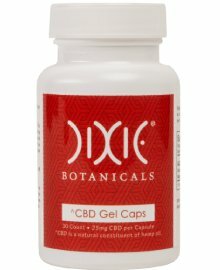 Dixie Botanicals CBD Gel Caps provide your daily dose of CBD in an easy to consume manner. Each of these CBD gel capsules is filled with full-spectrum hemp-oil of 25mg. Besides each contains medium chain triglyceride (MCT) oil which is derived from coconut oil to boost absorption. The jar is ultra-compact contain 30 capsules, and can be discretely carried to your workplace, gym or in your luggage. 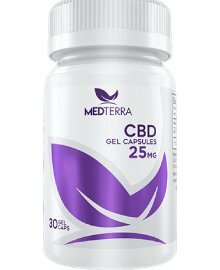 MedTerra CBD Gel Capsules are a fast way when you just need the goodness of CBD isolate. Like many other brands, there is 25mg CBD per softgel with a sleek 30 caps container. The customer service is pretty good with free shipping worldwide for orders over $125. The independent results are available upon request. The gelatin softgels contain a mix of CBD isolate and MCT oil. MedTerra manufactures all its products from non-GMO hemp grown in Kentucky. These are slightly priced on the expensive side. 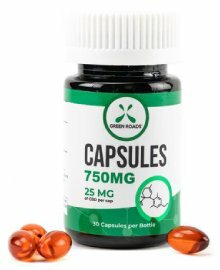 These Green Roads CBD Capsules offer a potent dose of CBD oil which has a vegetarian base and is available in an easy-to-use form. The strength is 25mg per softgel and there is free shipping on orders over $100. All Independent Test Results are available online. The ingredients include vegetarian softgels which combine CBD with easy to digest Safflower oil. The hemp is pharmaceutical-grade U.S. grown hemp. For those who do not enjoy the taste of organic, raw hemp oils which need to be placed under the tongue, the gel caps are a great way to ingest CBD. They are usually tasteless when swallowed quickly with water and you can enjoy the benefits minus the bitterness.